To provide education and knowledge sharing opportunities that improve the loss control capabilities of our members, and to raise awareness of the benefits of professional loss control practices. Welcome to the Insurance Loss Control Association (ILCA)! Hello and welcome to the Insurance Loss Control Association! I was honored this winter to be elected President and am looking forward to furthering the success of the organization. It is an exciting time for ILCA, as we continue to see growth. For those that may not be familiar, we are the only professional organization dedicated solely to the Loss Control field in the Insurance Industry. Our membership consists of loss control professionals and underwriters looking to further their networking opportunities, expand their industry knowledge, and be active advocates for the loss control field. Our prominent event is our conference, held annually in October. This past year was another successful event, as we had more than 25 different carriers and brokers in attendance with a record number of first-time attendees. The conference was held in Hoffman Estates, IL and included topics such as Food Safety, Trends in the Healthcare Industry, Wearable Technology, and Fire Suppressions systems to name a few. This year, we are actively working on new initiatives such as hosting webinars periodically during the year on a variety of topics. Stay tuned through our website and LinkedIn page for further updates. We are also continuing to grow our student membership with colleges and universities offering safety related degrees. This program has allowed several student members to make the necessary connections to obtain a needed internship or full-time position after graduation. I can personally advocate for this program as I had obtained my internship (which lead to full-time) from being a student member during my undergraduate years. Planning for our 2019 conference began early in the year with dates and a location coming very shortly. We hope that you consider attending this event and encourage others to do so as well. If you are not already a member, I invite you to visit our webpage at www.insurancelosscontrol.org and register. In addition, we are always looking for speakers, so if you are interested in presenting on a topic, please do not hesitate to reach out to myself or another member of the ILCA Board. Again, welcome to the Insurance Loss Control Association and we hope to see you at our conference in October ! If you are interested in presenting at our annual conference, you can find more information by clicking the link below. As a way to help ILCA members with training, we have added a new glossary of loss control terms to our website. You can access them by clicking on the training tab or clicking the Glossary link below. 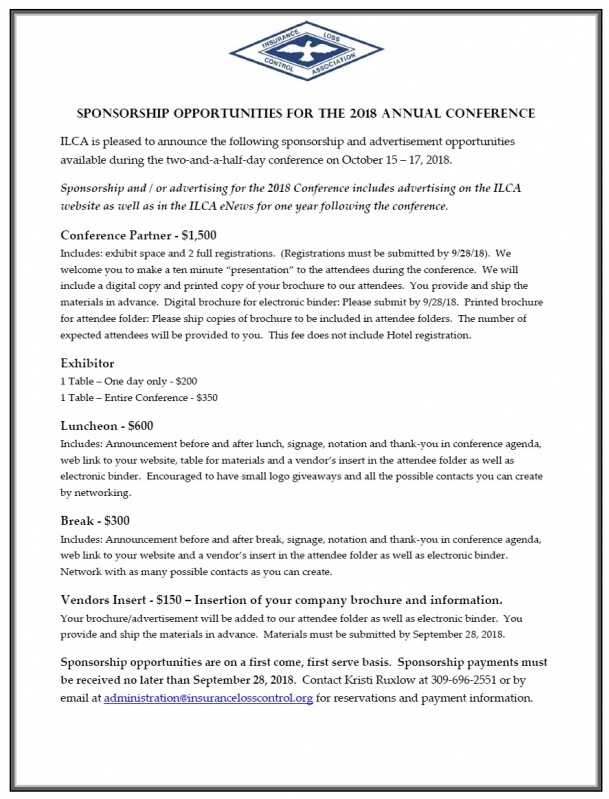 How will ILCA membership benefit me? Members become more knowledgeable and gain valuable experience in loss prevention techniques. Members have opportunities to network with other insurance professionals and develop leadership skills. Members are kept abreast of the changes in the insurance industry and loss control profession. Members discover solutions for technical problems and emerging issues. Members receive ILCA's eNews which provide valuable information on technical matters. ILCA Membership qualifies for one (1) point for Continuance of Certification (COC) point for Certified Safety Professionals (CSPs) and Certified Loss Control Specialists (CLCSs) in the category of Safety Organization / Division Membership. Attendance at the annual conference qualifies for one (1) COC point for CSPs and CLCSs in the category of Professional Development Conference Attendance. What can I do for ILCA? Prepare and submit articles on topics of general interest to ILCA's eNews. Deliver presentations on loss prevention topics at the annual conference. Get involved in ILCA's leadership committees. Service as an officer qualifies for one (1) COC point for CSPs and CLCSs in the category of Professional Services. Am I eligible to join ILCA? Yes! If you are affiliated with the insurance industry and have an interest in the prevention of loss in the property / casualty field, we urge you to join ILCA today. Students in safety, risk management and insurance programs are open to join as a student member. Annual dues are $90.00 for professional members, while qualified student member dues are waived. ILCA is hosting a Playground Safety Webinar on May 2, 2019, at 1:00pm Central time for MEMBERS ONLY. Angie Lawless will be presenting the webinar. The link to register for the webinar is: https://register.gotowebinar.com/register/7466248399943457282 Registration is required. This is a free webinar.